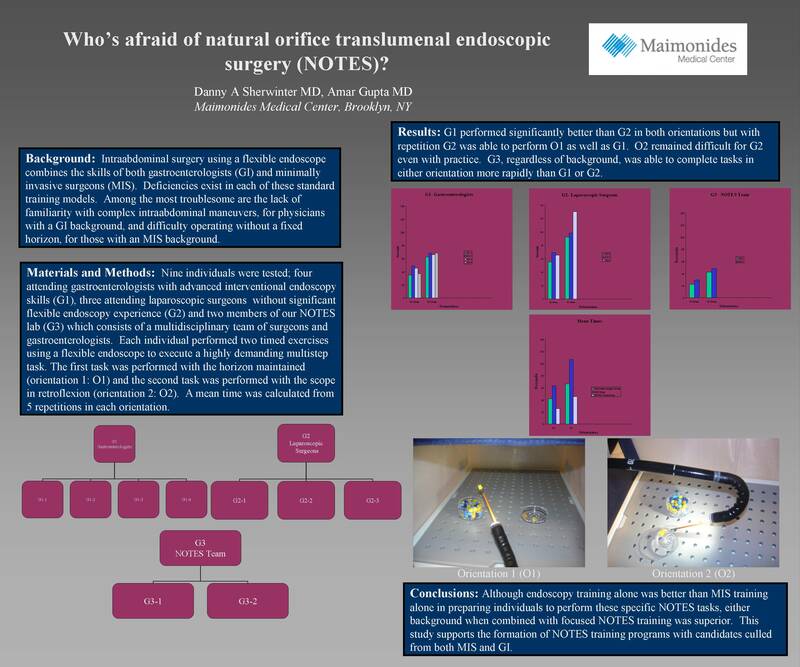 Who’s Afraid of Natural Orifice Translumenal Endoscopic Surgery (notes)? Introduction: Intraabdominal surgery using a flexible endoscope combines the skills of both gastroenterologists (GI) and minimally invasive surgeons (MIS). Deficiencies in each of these standard training models include the lack of familiarity with complex intraabdominal maneuvers, for physicians with a GI background, and difficulty operating without a fixed horizon, for those with an MIS background. Materials and Methods: Nine individuals were tested; four attending gastroenterologists with advanced interventional endoscopy skills (G1), three attending laparoscopic surgeons without significant flexible endoscopy experience (G2) and two members of our NOTES lab (G3) which consists of a multidisciplinary team of surgeons and gastroenterologists. Each individual performed two timed exercises using a flexible endoscope to execute a highly demanding multistep task. The first task was performed with the horizon maintained (orientation 1: O1) and the second task was performed with the scope in retroflexion (orientation 2: O2). A mean time was calculated from 5 repetitions in each orientation. Results: G1 performed significantly better than G2 in both orientations but with repetition G2 was able to perform O1 as well as G1. O2 remained difficult for G2 even with practice. G3, regardless of background, was able to complete tasks in either orientation more rapidly than G1 or G2. Conclusions: Although endoscopy training alone was better than MIS training alone in preparing individuals to perform these specific NOTES tasks, either background when combined with focused NOTES training was superior. This study supports the formation of NOTES training programs with candidates culled from both MIS and GI.